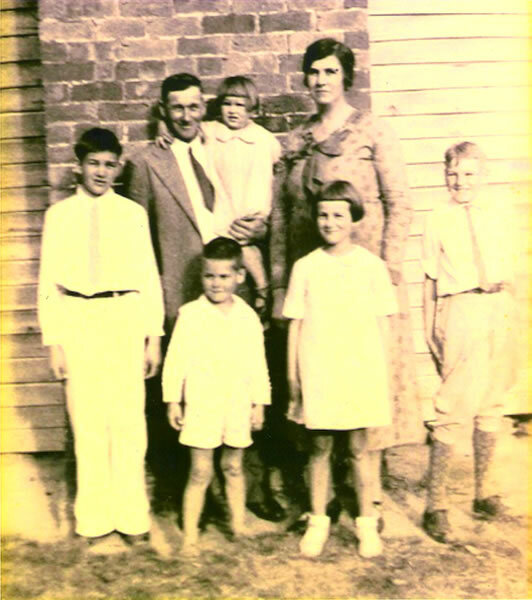 Special thanks to Mary Lee Epperson King for sharing these words about her mother, Lula Watson Epperson and her father, Harry Arnold Epperson, Sr. Mary Lee is pictured in her father’s arms beside her oldest brother Ralph along with three of her four other siblings. We lived among our aunts and uncles on both sides of the family in Ararat, Virginia. All we knew while growing up on a farm was real hard back breaking work from about 4 a.m. to dark. Feeding mules, chickens, pigs; milking cows; cutting trees and clearing new ground; hoeing, chopping, topping corn and tobacco. On Sundays we looked forward to going to church and other gatherings for relaxation. My parents were a good team. They encouraged us to be educated. They both were spiritual and believed the Lord would lead us. We prayed a lot and read the scriptures at every meal. We carried our Bibles with us to the fields. Prayer and hard work helped us to find our place in the world . My mother wanted Ralph to be a preacher. Ralph said Ma I’m not called be a preacher but how would it do if I had preaching on the station. And she said that would do. That was probably the beginning of Christian broadcasting in our family. Ralph was the beginning. He was instrumental in getting a lot of people interested in radio. He was a good example for the rest of us. Mary Lee, who worked at WPAQ in the early years, went on to teach in the Mount Airy City Schools for thirty five years. She continues to stay active through substitute teaching and volunteering.